A 500-year plan for a forest! At a place called Earth Sanctuary on Whidbey Island in Washington State, Osprey and Song Sparrows raise their young. Swainson's Thrushes and Yellow Warblers find a welcome refuge when they return from South and Central America. 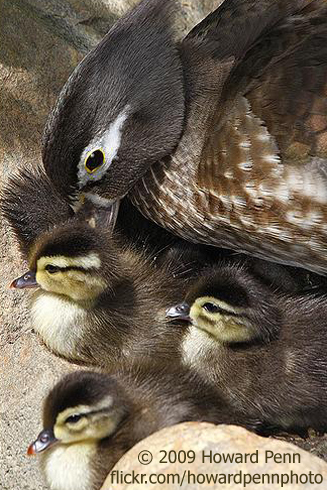 The Wood Duck young seen here have a safe place to grow. Chuck Pettis is creating this sanctuary. Chuck's goal is to create an old-growth forest, so he's looking ahead 500 years. We’re at a place called Earth Sanctuary on Whidbey Island in Washington State. Here, among ponds and trees, Wood Ducks, Osprey, and Song Sparrows raise their young. Swainson’s Thrushes and Yellow Warblers find a welcome refuge when they return from South and Central America. Chuck Pettis is creating this sanctuary. Chuck’s goal is to create an old-growth forest, so he’s looking ahead 500 years. 500 years?! But why be the one to invest in nature?